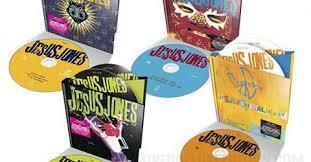 Share the post "Album review: JESUS JONES – Reissues"
Jesus Jones, for me, were always the acceptable face of electronic music in the ‘90’s. There were others doing similar things at the time, EMF and Pop Will Eat Itself to name but two, but none had the same underlying rock credentials as Jesus Jones to my mind. What we have here is the band’s four albums remastered and repackaged with the addition of a second disc laden with remixes, promo tracks and ‘B’ sides to please even the most die-hard fan. Debut album Liquidiser was released in 1989 and met with critical acclaim and found the band in both the single and album charts. The album was an original blend of electronica, rock and techno with a real energy which attracted fans from all genres. Sophomore album Doubt was recorded in 1990 but wasn’t released until the following year. The delay, however, had little effect on the album’s success as the band built on their growing fanbase and delivered the biggest hits of their career. Commercially this was the band’s peak and with the three single releases all charting highly in both the UK and the US Jesus Jones were a household name. 1993 saw the release of the band’s next album Perverse. Whilst ‘Doubt’ had been the band’s biggest commercial success many look on ‘Perverse’ as being their creative peak, myself included. This was one of the first albums to be recorded digitally as the band embraced the latest technology. Opening track ‘Zeros And Ones’ leaves you in no doubt that the guys mean business on this record with its driving synth pattern, heavy rhythm section and big guitar riffs. This is by far the band’s heaviest outing with even the odd prog influence in the mix on the likes of ‘Yellow Brown’ and ‘Spiral’. The commercial edge is still evident though with the singles ‘The Devil You Know’, ‘The Right Decision’ and the aforementioned ‘Zeros And Ones’ all charting but in the lower reaches of the chart. These reissues serve as a reminder to the listener of what a creative and talented band Jesus Jones are and how for a brief period in the 1990’s they were main players in the music industry. The second discs that accompany each release may only be of interest to the most hardened fans, I must admit I won’t be dusting them off too often, but the remasters of the originals are reason enough to rekindle your interest in these ‘International Bright Young Things’! This entry was posted in ALBUM REVIEWS, ALBUM REVIEWS (Mobile), All Posts, Reissues and tagged 90's, album, Already, CD, DouBt, electronic, International Bright Young Thing, Jesus Jones, Liquidiser, Mike Edwards, Perverse, pop, reissue, review, Right Here Right Now, rock, Techno, Zeroes and Ones. Bookmark the permalink.